This was an 18-year study that determined that BXM returned annual percentages of 11.77% compared to the S&P 500 returns of 11.67%. However, BXM did so with a standard deviation (volatility) of 9.29% compared to the 13.89% of the S&P 500, one third less. This 16-year study concluded that BXM returns 12.30% per year compared to 12.20% of the S&P 500 also with two thirds the volatility. Although this time frame was an aberration as it included one of the worst recessions in US history, it is clear that BXM (blue) slightly outperformed the S&P 500 (black) for the first 4 years but not so far in 2013. Generally speaking, in the long run, the returns will be similar. Most studies undertaken to evaluate the covered call writing strategy do not take advantage of all the opportunities that exist to elevate returns. 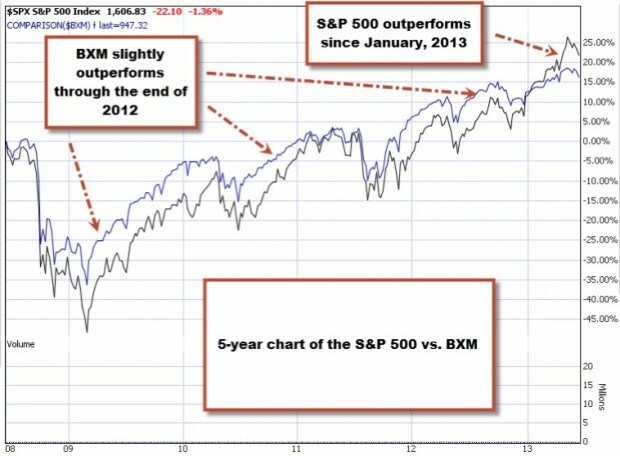 BXM will mirror the returns of the S&P but with much less volatility. The BCI system will elevate the returns of BXM by implementing fundamental, technical and common sense parameters. Which approach is best for you is something only you can determine. Once educated, the right choice will be an easy one to make. For the week, the S&P 500 declined by 2.1%, for a year-to-date return of 13%, including dividends. 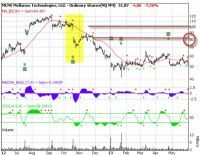 BCI: This site remains bullish on the overall economy but because of the market over-reaction to Chairman Bernanke’s comments will take a defensive posture for the July contracts and use predominantly in-the-money strikes. 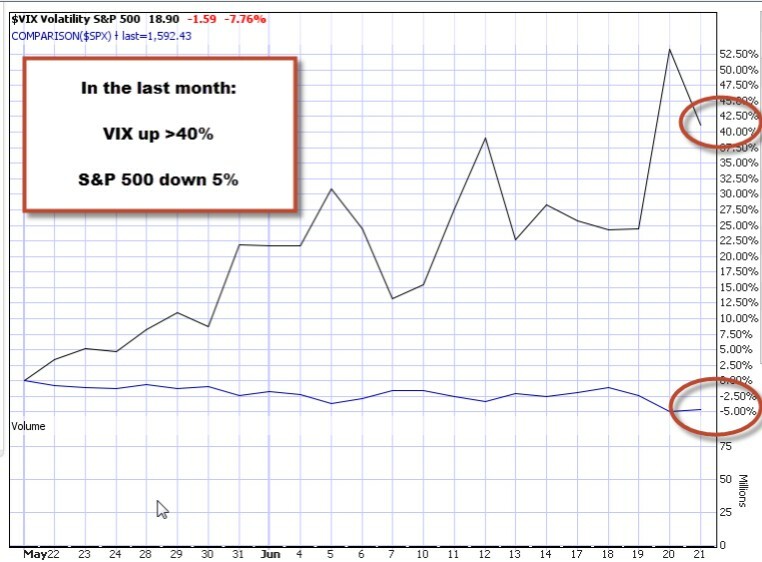 The Weekly Report for 06-21-13 has been uploaded to the Premium Member website and is available for download. Can you suggest the best places to get a list of option price quotes? In your books you seem to favor Yahoo. 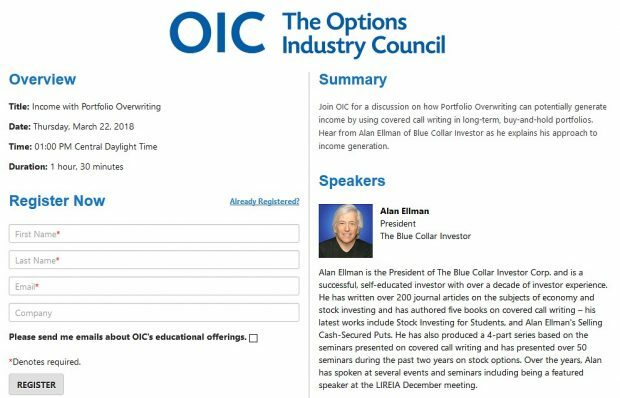 I am a newbie to Options Trading and my research into a conservative initial approach has led me to covered calls which in turn has led me to your great website. I am going through the self-education phase and I am enjoying your website and your beginners videos greatly – Thank You ! It is my intention to lear more about the BCI methodology and probably to subscribe to your service. I have a question for you regarding the question from Paul re MLNX stock option call with an $8.00 price. I understand your explanation that this represents almost all Implied Volatility and that from the Seller’s viewpoint there is a higher risk of stock downside associated with the seemingly too good to be true price. What I am struggling to understand is the “other side of the coin” – ie. the market or buyer’s perspective: Why would anyone be prepared to pay $8.00 for a stock option which in my mind (and very limited knowledge at this stage) represents also a high degree of risk to the buyer ? Is it just that it is the belief/expectation of a number of buyers, for whatever reasons, that the stock will go up by that amount. If you have a few moments for a brief reply it would be greatly appreciated. I believe that it is a valuable exercise to view the option trade from the other side from time to time to get a different perspective and understanding of options trading. In this case, the high IV of the options means that the market is anticipating a large price movement prior to expiration and the reason centers around the earnings report. 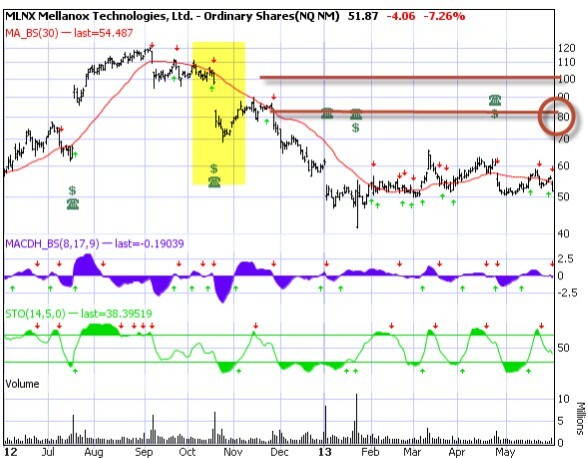 As you can see on the chart below the price has moved dramatically over $20 after the last 2 reports (see the $ signs). This price change can occur in either direction. More than quadruple the return for the option buyer (compared to the stock buyer) IF the trade worked out the way he (she) hoped it would.